If you have resources or tools you would like to share on this site, please send them to service@corhealthontario.ca. EVT is a stroke treatment for patients with acute ischemic strokes that removes large stroke-causing clots from the brain and substantially improves the chance for a better outcome. Time-is-brain in acute stroke treatment and prolonged times to accessing EVT may reduce benefits for eligible patients. There have been five major trials that demonstrated efficacy with major functional benefits for patients. The ESCAPE trial revealed that a procedure called Endovascular Therapy (EVT) increased positive outcomes by 25% and reduced the death rate by 50% from major ischemic strokes. 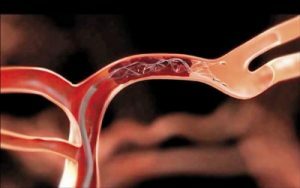 The procedure, EVT, involves mechanical clot disruption (embolectomy) carried out by neuroradiologists, neurosurgeons, or neurologists with neurointerventional expertise. The Mr. Clean Trial was the one study that was completed and demonstrated positive outcomes for patients. Subsequent to Mr Clean, the ESCAPE trial was stopped early due to overwhelming positive results and concurrent positive results of the EXTEND-IA trial. Two further trials SWIFT-PRIME, and REVASCAT have been stopped early and results have been published. To learn more about Endovascular Thrombectomy, click here. CorHealth Ontario established a Provincial Working Group to develop an implementation strategy for Endovascular Treatment (EVT) across the province, in conjunction with clinical experts. To adapt our stroke system to support patients’ access to endovascular therapy, CorHealth Ontario is working with stakeholders from across the province. Stakeholders include: EMS, CritiCall Ontario, Emergency Medicine, Stroke Neurology, Regional Stroke Centres, District Stroke Centres, Telestroke, and Neurointerventional/Stroke Endovascular teams. Each stroke region is working with their partners and stakeholders to support access to acute EVT therapy.